Advocacy – Canadian Meat Council – Good for you. Good for Canada. CMC represents its members on different initiatives including market access, trade, labour, and government relations. We aim to protect our member’s ability to remain competitive, grow and innovate, while furthering the red meat sector and serving new and growing export markets. Advocacy is critical to the success of any industry. At times it is done to achieve certain objectives and more often, effective advocacy is to stop the implementation of a policy that could be detrimental to industry before it is put in place. Our industry is not one where the government has it top of mind – It should. 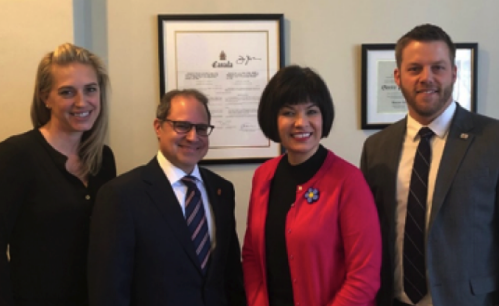 CMC staff, Marie-France MacKinnon and Chris Nash and Board Member, Henry Mizrahi, Lesters Food met with the Honourable Ginette Petitpas Taylor, Canada’s Minister of Health in April 2018 to discuss stronger collaboration between Health Canada and the meat industry. CMC Director of Beef, Kim O’Neil was in Santiago, Chile with former Minister of International Trade, the Honourable François-Philippe Champagne for the historic signing of the CPTPP. 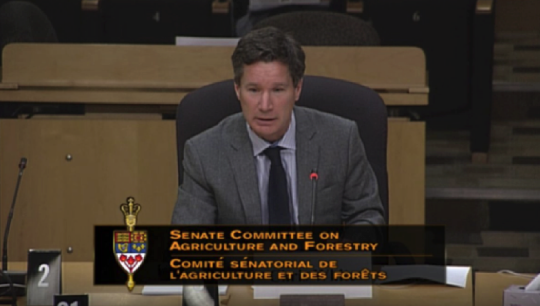 CMC President Chris White providing testimony at the Senate’s Standing Committee on Agriculture and Forestry March 2018. CMC is able to be an effective advocate for our members because we understand the Ottawa environment, we have a clear sense of the broader policy objectives of the government and they have recognized that we see what they are looking to accomplish and they see that CMC’s members can help them deliver. As we have done in the past and will do so in the future. We have regular touch points with key decision makers, elected and non-elected. We have a strong policy and regulatory capacity that allows us to provide government with strategic and cogent advice. We look at ways in which CMC can bring other stakeholders in as partners in files with government to ensure a stronger and more informed industry position for government to consider. We ensure that government can hear directly from our members when needed and provide government with the most current data and market intelligence our members share with us.